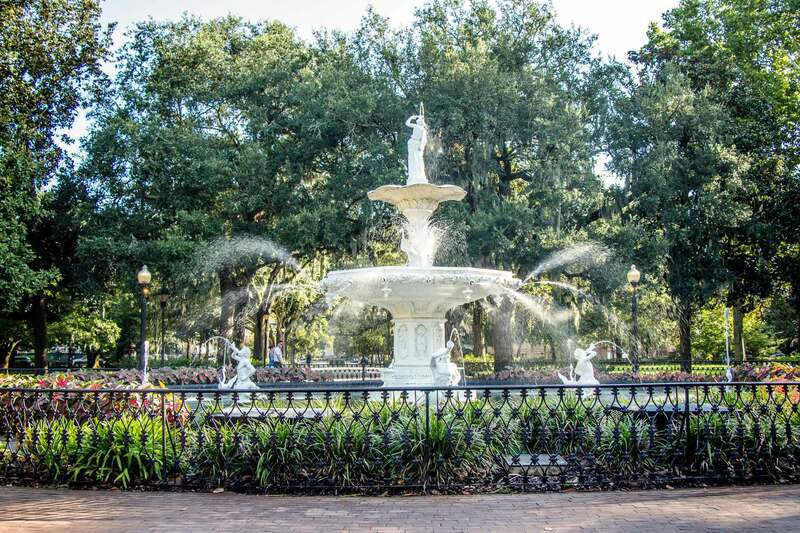 Savannah is known for its antebellum architecture, beautiful parks, horse-drawn carriages and its majestic oak trees, draped romantically in Spanish moss. We arrived in Savannah with our two kids (aged 2 & 5) after 3 exhausting days in Orlando. 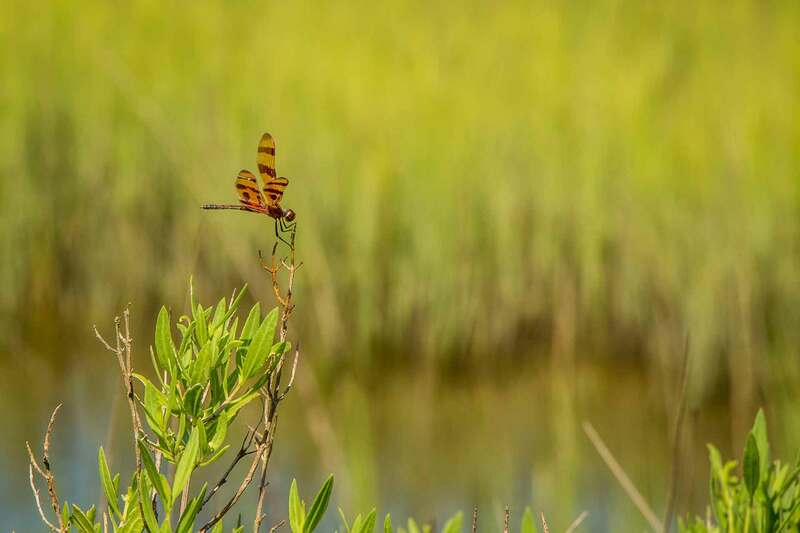 We wanted to see the historic side of Savannah, but after the recent theme park madness, we also desperately craved some nature. Savannah delivered very nicely on both accounts. After driving all morning from Orlando, we were excited to set out and see Savannah. 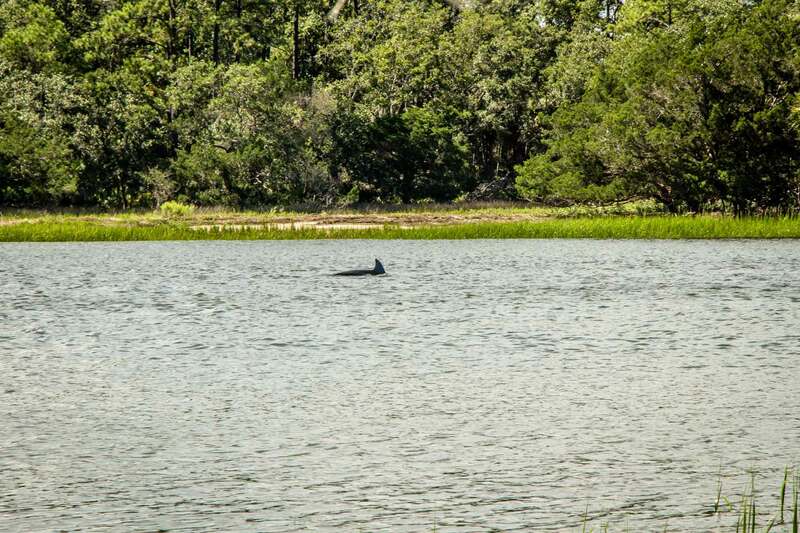 As mentioned, we were desperate for some time in nature, so the Wormsloe Historic Site was a perfect fit. 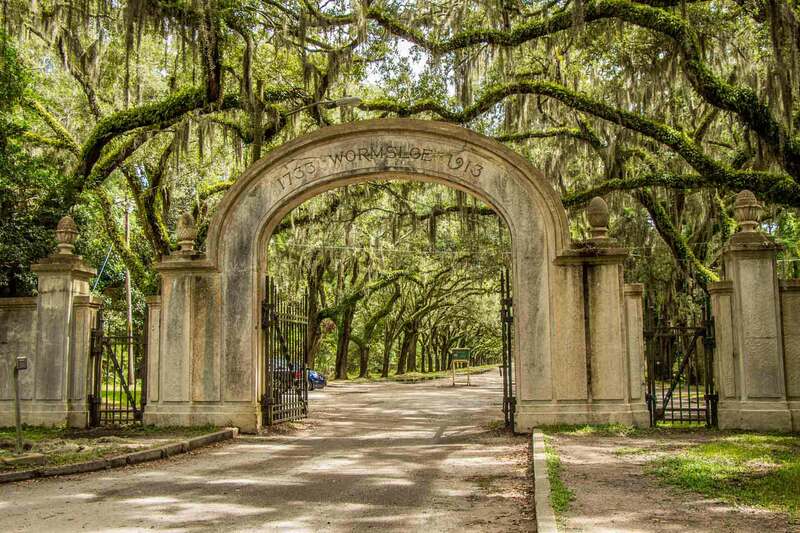 Chances are that if you’ve looked into visiting Savannah, you’ve seen pictures of the majestic row of towering oak trees covered in drooping Spanish moss found at the Wormsloe Historic Site. 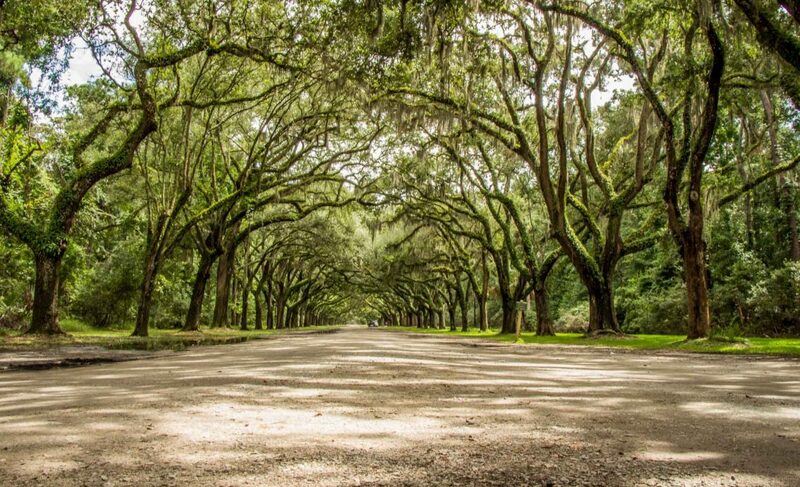 The visual effect of these majestic ancient oak trees, whose massive limbs stretch over and cover the roadway for as far as the eye can see is very special. We were there on a Friday afternoon in early August and it wasn’t that busy. There were a few people parked on the roadside a few hundred feet from each other, setting up tripods or simply taking family photos, but it was still reasonably easy to get beautiful pictures without anyone in them. Given the incredible beauty of this row of oak trees, we took quite a while taking pictures and letting the kids run around. We had wanted to hike the 3 mile (4.8km) trail through the Wormsloe Historic Site, but by the time we had finished with our pictures, we only had around an hour left to explore. 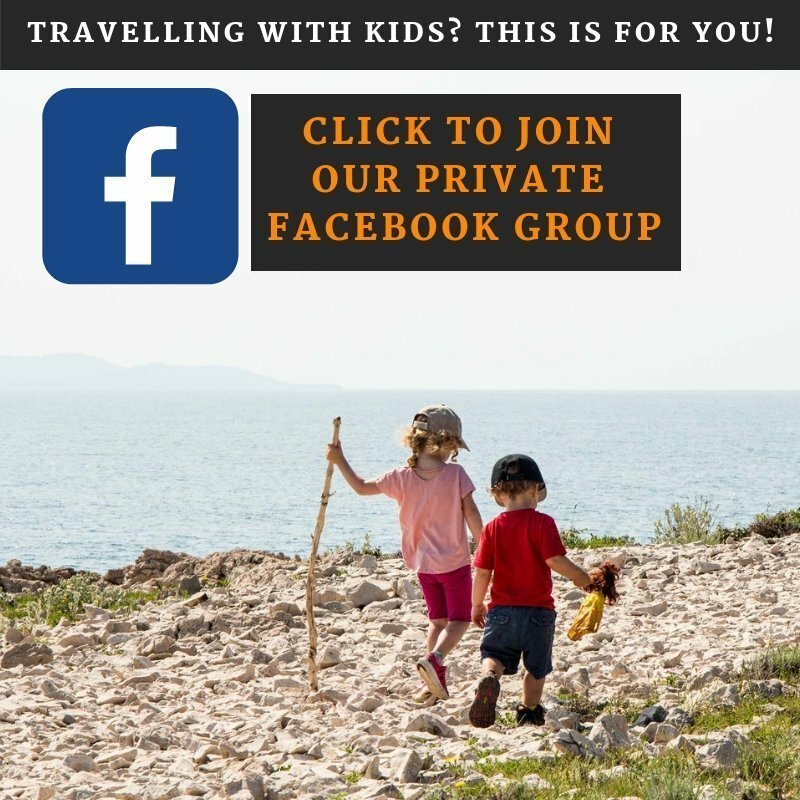 We could have carried the kids and completed the hike in under an hour, but after driving all morning we wanted the kids to get some exercise and explore in a forest environment which is new to them. They loved seeing the new types of plants, especially the wide variety of mushrooms which are way more exotic than we have back home in the Canadian Rocky Mountains. 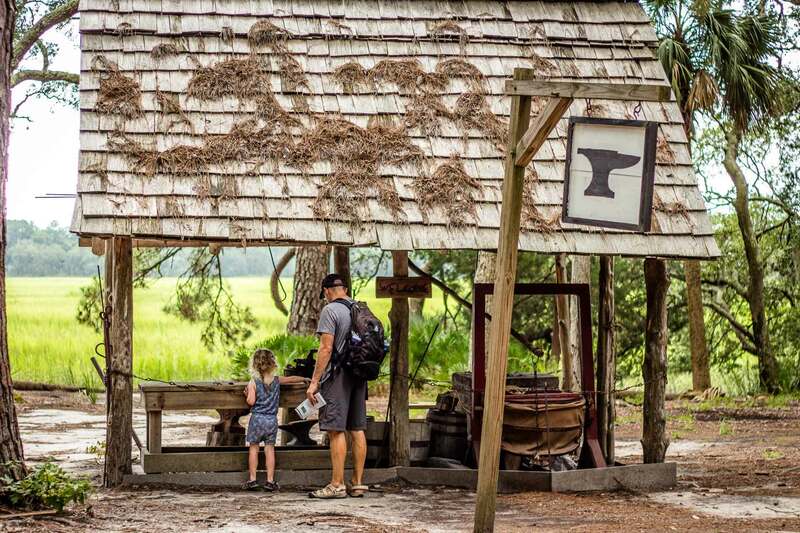 We walked down a hiking path to the Colonial Life Area where the kids had fun looking at an old blacksmith’s shop and a replica house from the plantation era. A quick stop at the picturesque lookout and we were on our way back to the car. We had to walk pretty quickly as the thunder (which had been rumbling lowly our entire visit) was getting closer, louder and longer. We got to enjoy the long row of oak trees one more time as we drove out. 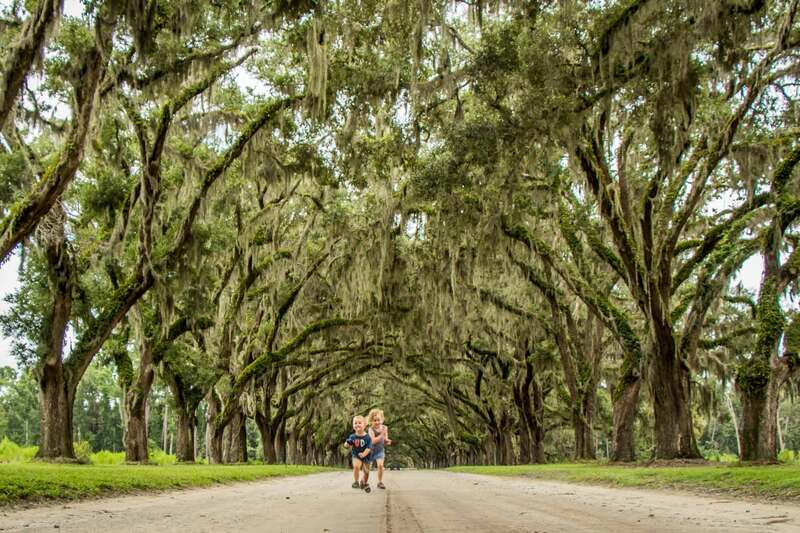 What an incredible sight – the Wormsloe Historic Site is a must see while in Savannah! On our first morning in Savannah we were out the door of our Airbnb at 8:15. We began our morning walk through beautiful Forsyth Park, enjoying the towering majesty of the large oak trees. The kids had fun running around, talking to the friendly locals and petting their dogs, while we enjoyed the beauty of the park and its amazing centerpiece fountain. After leaving the park we traveled north on Bull Street, enjoying the historic architecture and the five amazing public squares along the way to the waterfront. Each square is well-treed with some form of monument in the middle (statue, etc.). It’s one of the nicest city streets I can remember anywhere in the world. 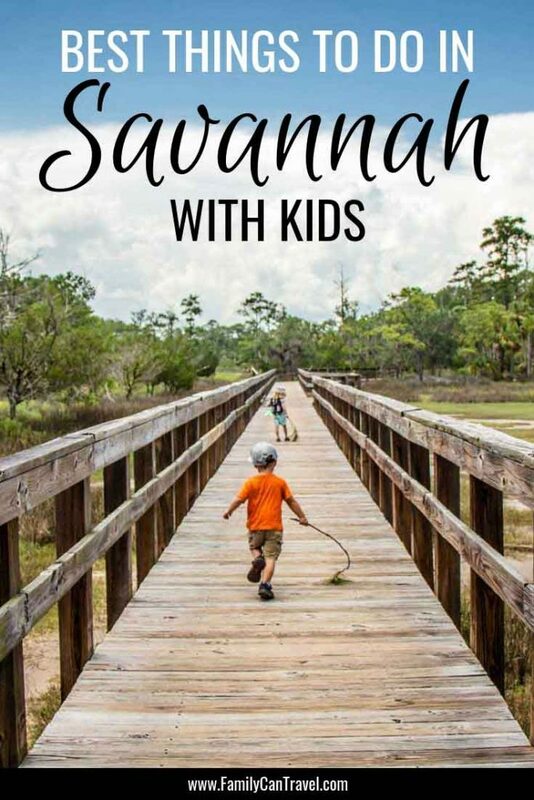 Upon reaching the riverfront, we stopped in the Visitor Information Center to let the kids use their restrooms as well as ask for some local hiking recommendations. 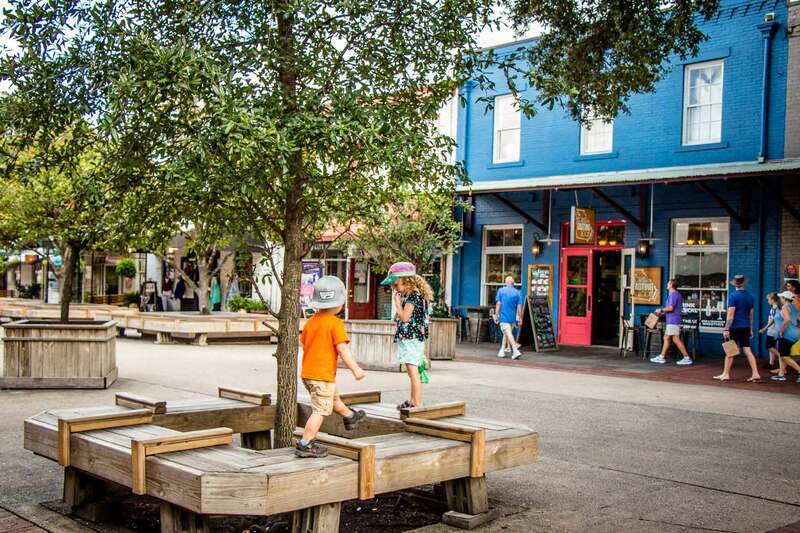 We walked both directions along River Street, doing some window shopping, while trying to resist the tempting smells wafting from the many candy shops. 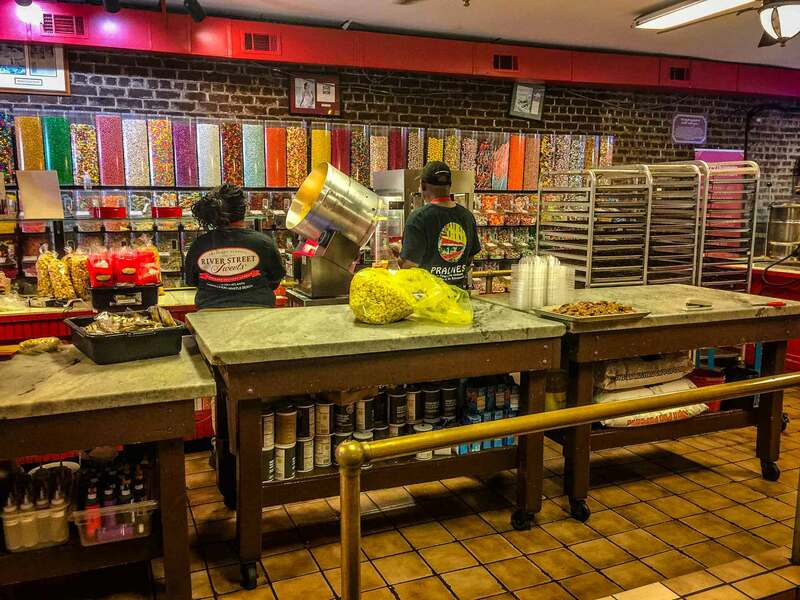 Ultimately, the wonderful smells got the best of us and we stopped in River Street Sweets for some freshly made Pecan Praline. Oh man, if you have a sweet tooth (like we do! ), this is such a nice treat! We finished the morning by walking through the City Market. This street is pedestrian only, giving the kids freedom to run free and climb on everything in sight – what a couple of monkeys! It was a hot, humid morning with the temperatures hovering in the high 80’s. 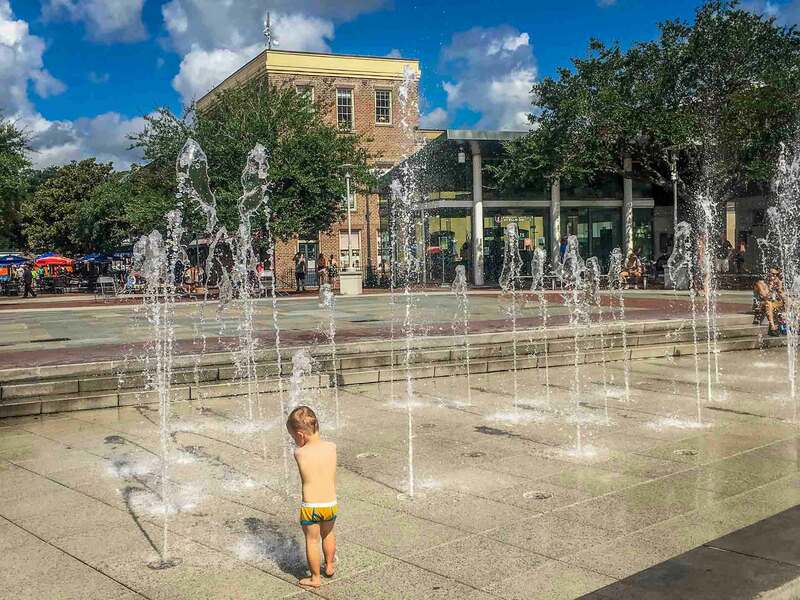 At the east end of the City Market is Ellis Square, another of Savannah’s great public spaces. Ellis Square had a small splash park in it, so we let the kids strip down to their underwear and run wild in the water park. They had walked nearly 3.1 miles (5km) in the Georgia heat, so they really deserved the opportunity to cool down while having a ton of fun. Once they kids had their fill of the splash park, we walked a few blocks to catch the free DOT bus which took us back to Forsyth Park where we began our journey earlier that morning. 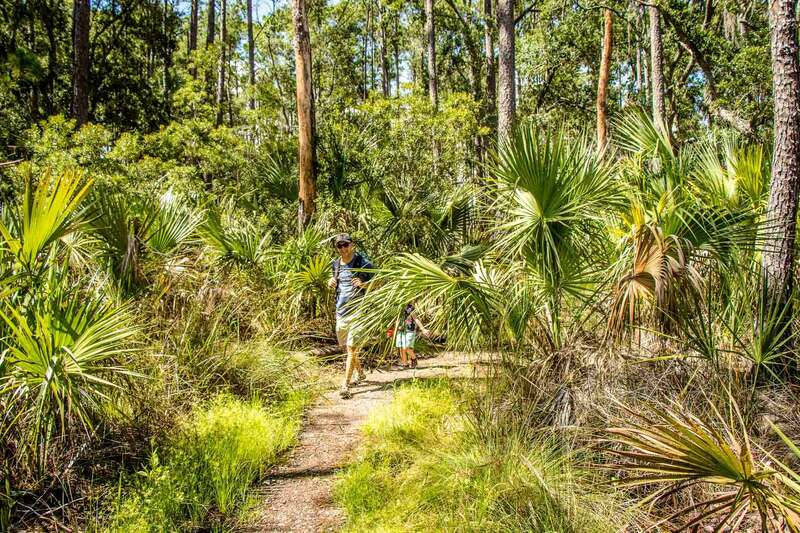 After our little guy’s nap, we hopped in the car and drove 20 minutes towards the coast to Skidaway State Park, one of the places the Visitor’s Center recommended for a good family hike. 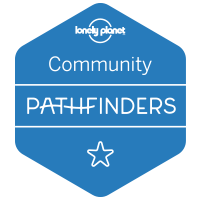 We didn’t have a lot of time, so we decided to walk one of the shorter trails (the Sandpiper Trail loop to the Avian Loop) totaling about 2 miles. 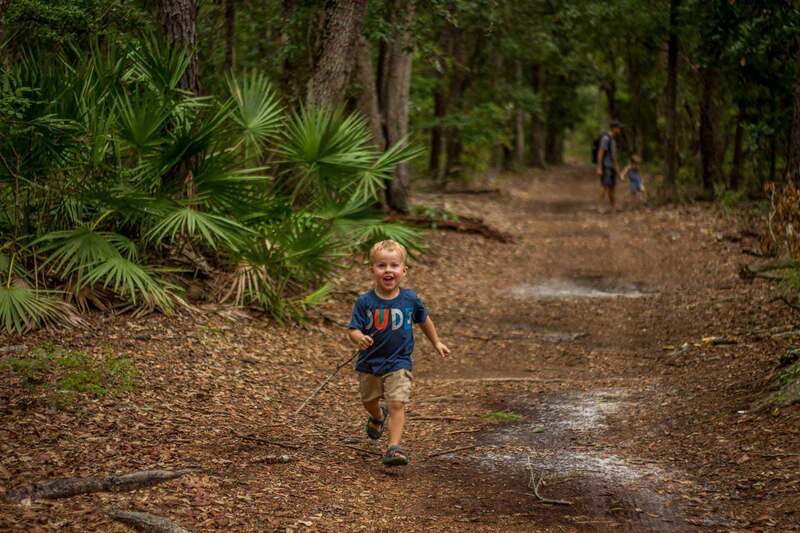 The Sandpiper Trail was a lot of fun for the kids. It begins with a long wooden boardwalk over a stretch of salt flats. When you look over the railing onto the salt flats you can see lots of little Fiddler Crabs scurrying about – you’d better be quiet though as they are skittish and will scurry down their holes if they hear a loud noise. The kids thought this was great fun, but being 2 &5 years old, they were unable to contain themselves and made a ton of noise,thus reducing their crab sightings. It didn’t seem to bother them though as they were having a hoot! 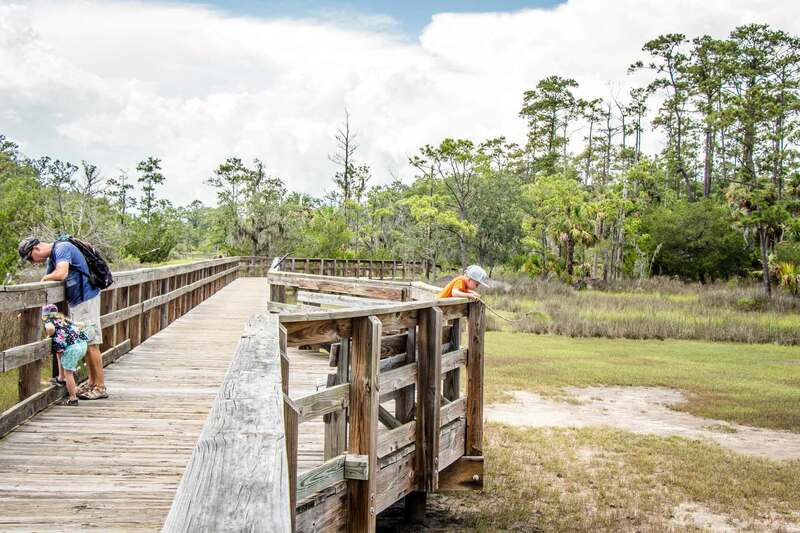 The trail continues alongside tidal creeks and through thin forest, with a wide variety of trees and lots of Spanish Moss. We saw a variety of birds, butterflies, dragonflies and bugs which all kept the kids entertained and walking slower than we’d like. The Sandpiper Trail meets up with the Avian Loop about halfway through the loop. The Avian Loop is pretty short, but is worth it for the chance to see Osprey hunting for fish and dolphins swimming down river. We didn’t have a nature guide with us, but we saw a large bird of prey circling overhead, so we assumed it was an Osprey, but even if it wasn’t, it was a magnificent bird. When the trail met up with the Skidaway Narrows River we saw some kayaks glide by. I thought the odds of us actually seeing a dolphin were so slim that I barely looked. But, in a matter of seconds, Celine saw a dolphin! It surfaced several times as it slowly swam up-stream. It was going slow enough and staying up long enough that even our 5 year old saw it – a very exciting moment for her! 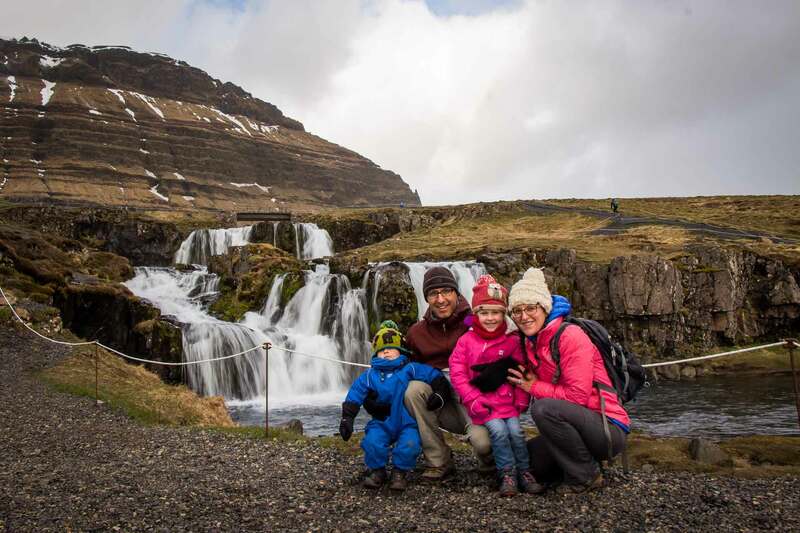 This hike was great for our family with small kids. It was a reasonable length for them and they both walked the entire way. There was enough interesting stuff along the way that it kept their interest. There wasn’t much tree cover though, so if it’s a hot day (as it was for us), make sure you bring sun hats, sunscreen and plenty of water. This morning we drove out to the Bonaventure Cemetery for a short walk before driving to Charleston. We’ve gotten into a habit of visiting famous cemeteries around the world as they are usually so beautiful and interesting to visit. 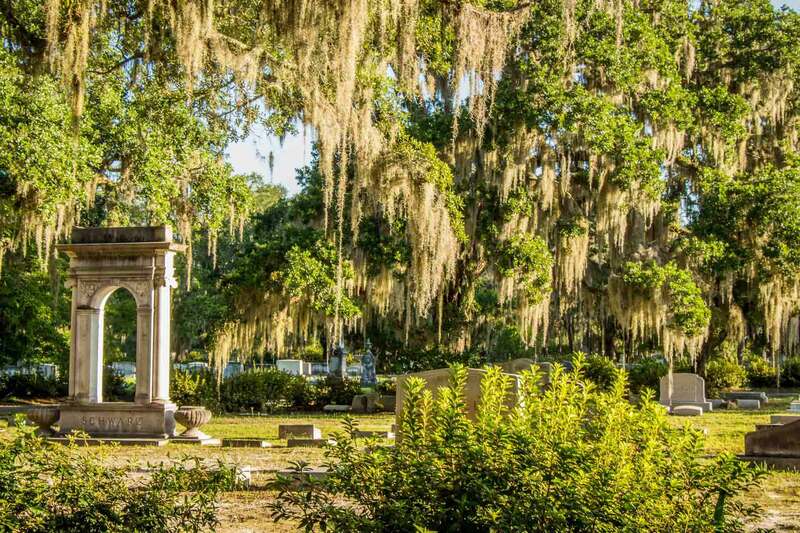 The Bonaventure Cemetery became famous when it was featured in the novel and subsequent movie, Midnight in the Garden of Good and Evil. When we got there, we were immediately impressed by the grounds with its old oak trees and Spanish moss. But at first glance the tombstones were actually pretty normal and not really interesting to look at. Perhaps we are becoming cemetery snobs, but we like walking through cemeteries to see the interesting and ornate tombstones. So rather than stop for a walk, we slowly drove through and looked at the beautiful surroundings for a while, snapped a few photos and went onto Charleston. Tours of this place are very popular, perhaps we should have joined one?